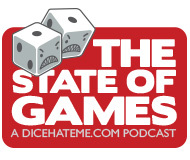 It’s hard to believe that almost exactly five years ago we plunged headlong into the podcasting world with the debut of The State of Games. It was just Cherilyn and me back in those wild west days of yesteryear, and it really feels like it was two blinks in the past. There’s been so much change between then and now, both in the hobby, in business, and in personal life, but at least one thing has stayed the same – being able to speak my mind about my favorite things and bring board gaming love to so many more. Congratulations on 100 episodes! That’s quite an accomplishment. Going back through your earlier shows, it’s interesting to see the changes which have occurred both for this podcast and throughout the hobby during the past five years. For what it’s worth I miss the booming echo intro of “Riddle of the Sphinx”. You’ve had many excellent episodes with a variety of guests, but one of my favorites was #43 with the Fleeples – I always enjoy your interviews with Ben and Matt. I raise a pint to you, Chris, and to all those who have shared hosting duties on the podcast over the years, especially long-standing regulars TC and Darrell. Thanks for sharing your interesting thoughts and views on board gaming. You keep me entertained and informed while making me think and laugh. Always time well spent. Cheers! Congrats on 100 episodes! I only started listening around #80, but you guys have quickly become one of my favorite podcasts. Regarding the TC Petty experience on Kickstarter, I think TC hit the nail on the head when he mentioned regretting not getting third-party reviews. After glancing at the various pledge levels, the FIRST thing I look for on a Kickstarter page is an unbiased video review as it typically gives me a sense of how the game plays and if it’s something I might enjoy. That’s not to say the blurbs you featured in the campaign aren’t useful (though I definitely think you need get quotes from more people unaffiliated with Dice Hate Me, The State of Games, The Geek All-Stars, UnPub, etc. so as not to seem biased) but they should be used to supplement rather than drive the marketing for the game. Don’t underestimate the networks that some of these third-party reviewers have–they can bring a lot of additional traffic to a project that might have otherwise have gone unnoticed by potential backers. Best of luck with everything in the future!